And then sometimes you poke the bear with a very large stick and improbably survive, as Brienne did just six weeks after I spoke to Benioff and Weiss. I can’t say I’ve worried much about their management skills since. Even so, this fifth season is shaping up to be something else entirely. Benioff and Weiss have always been able stewards of George R.R. Martin’s story, but what we’ve seen so far has suggested something more enterprising and artful. There’s been a shape and flow to the early episodes that’s unique to the Seven Kingdoms as we’ve known it — and exhilarating to viewers. In the past, an average Game of Thrones episode was entertaining but imbalanced: Like Arya and the Hound1 on a seesaw,2 all the weight was collected at one end. From the dull thunk of the executioner’s sword in “Baelor” to the whoosh of the open moon door in “Mockingbird,” it was possible to view Thrones’s consistently dramatic codas as a window into the showrunners’ process: Were they reverse-engineering episodes from back to front? I suppose it’s sound thinking: Sunday nights can be as dark and plodding as need be as long as audiences are left full of terror by the time the credits roll. More than any one plot or character, Game of Thrones is essentially a show about an epic journey. Ten mini-destinations a year can help sugar the pill. I say this not to look back in anger but to look ahead with glee. Its ending was plenty dramatic, but it matters much more that “High Sparrow” had what may well be the most haunting and beautiful opening of any episode in Thrones’s history. Mark Mylod’s camera plunged us, unprepared, into vertiginous, claustrophobic darkness. Ramin Djawadi’s score, usually pitched between triumph and menace, veered instead into ragged abstraction; it sounded as if all the rains of Castamere had poured down upon the string section, warping the wood of the instruments from within. Then the image flipped: We were inside a stark stone room. A castle? A crypt? Whispered voices echoed off the walls, masking, for a moment, the harsh rasp of a broom sweeping back and forth across a filthy floor. Was that Arya Stark? And was that the magic Jacuzzi from Lost? Dude! Don’t drink the water! That Arya’s adventures in The House of Black and White appear to have much in common with Daniel LaRusso’s in Reseda doesn’t much matter. Sometimes style can matter more than originality. (And in genre storytelling, it very often does.) 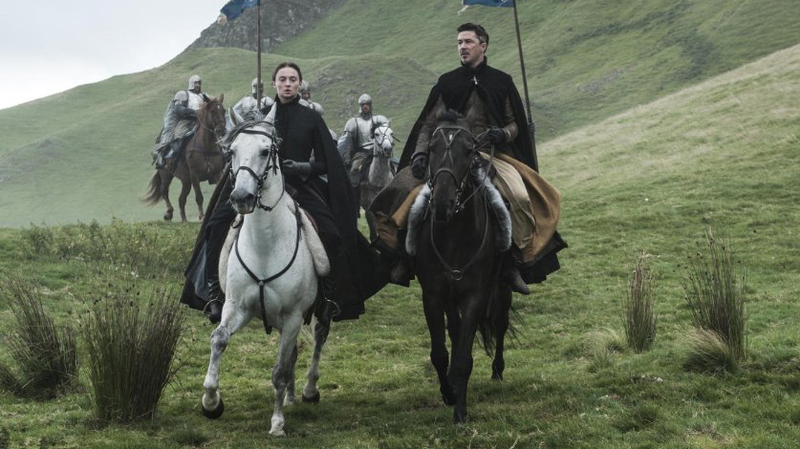 No show on television uses physical space quite like Game of Thrones:3 The vast, ugly blankness of the countryside where Brienne and Podrick roam and the terrifying whiteout North of the Wall is counterbalanced by the close, smothering propriety of throne rooms and temples. Thrones can turn us from agoraphobes to claustrophobes and back in the span of a few scenes. Here, it did something new: It turned us upside down. But it’s not just arty beginnings that prove that Benioff and Weiss are flexing their muscles. It’s middles, too. Back in 2013, they scoffed at my suggestion that individual episodes might have unpackable themes. “Themes,” they told me, “are for book reports.” Which makes it particularly interesting that Thrones appears finally able to weave ideas across disparate story lines now that the strict book reporting of the early seasons appears finished. If last week’s episode was concerned with the heavy burden of crowns, “High Sparrow” was very much about the weightier struggle of those denied the chance ever to wear one. As bad as it seems right now for Tyrion, it’s significant that his options still include visiting brothels, not just working in one. Cersei Lannister is as smart and devious as her little brother and twice as vicious. And yet, just as many of her peers (and even elders) are reaching their prime,4 she’s being nudged into irrelevance. Though proficient with many lethal, if subtle, weapons — eye daggers, lip curls, dismissive drinking — the only skill for which she’s respected fell out of favor right around the time King Robert had a run-in with a boar. Over the course of the series, Cersei has lost her husband, son, and father. Though she required precisely none of them to do what she does best — light treason, dwarf murder, etc. — court convention is pushing her further and further to the sideline. It’s nearly as frustrating for the viewer as it is for Cersei. She’s an Olympic vaulter unfairly disqualified for lacking an unnecessary pole. What makes Cersei’s humbling all the more painful is that its prime instigator is Cersei herself — or at least a younger version of her. Margaery is as sly, calculating, and ambitious as the Lannister teenager we saw in the season-opening flashback. Worse, Margaery knows it. After a mercifully brief royal wedding — I’d say that Tommen and Margaery’s nuptials were the Westerosi equivalent of a shotgun marriage, but I think we all remember what a Westerosi shotgun marriage actually looks like — the new queen gets busy getting busy. The union is barely consummated before Margaery begins making her move, concern-trolling Tommen about his mother and wondering — really just spitballing here — if Cersei might be happy living somewhere else? Thus begins the latest and certainly greatest installment of The Real Housewives of King’s Landing.5 Cersei, clutching lamely at her son, faux-compliments her daughter-in-law by comparing her looks to “a doll. She smiles quite a lot. Do you think she’s intelligent?” Later, when Cersei approaches Margaery and her giggle-circle, the new queen smiles like Ser Pounce in the dairy aisle. “I wish we had some wine for you. It’s a bit early in the day for us.” Glorious! One could survive in the Dornish desert for a decade with shade like this! But Cersei is a Lannister, not a Tyrell. She doesn’t get off on jousting. She plays for keeps. So while whatever pride she swallowed in front of Margaery ferments into bile, Cersei explores the less direct approach. After all, I don’t think it was godliness that drew her to the man known dismissively as the High Sparrow.6 (With his generous attitudes regarding footwear, it’s best to consider him less as a religious radical and more as the CEO of Toms.) Cersei isn’t pious. She’s a pragmatist. “The faith and the crown are the two pillars that hold up this world,” she tells the Sparrow. “One collapses, so does the other.” Translation: If I’m losing my grip on the latter, you’d better believe I’m digging my nails into the former. Cersei might be losing the game — for the moment — but she’s still playing at a higher level than poor Sansa Stark. The trap laid for her by Petyr Baelish is a masterpiece of subterfuge and emotional manipulation. His finger may be little, but his cons are incredibly long. He’s an executioner who spends years undercover as a tailor: Once the suit is fitted, he sighs and tells you the only tie that could possibly match is a noose. But, of course, this is Season 5 of Thrones, not Season 1. Sansa knows that for all the snake oil leaking off Littlefinger when he lays out exactly why she should become betrothed to another sadistic pipsqueak, he’s not totally wrong. “There is no justice in the world, not unless we make it,” he says. And a young woman like Sansa can’t make that justice with an army, no matter what color she dyes her hair. Becoming more than a “bystander to tragedy” likely involves allowing some of that tragedy to be visited upon herself. It’s tough to imagine, but even with three glistening dragons in the cast, Thrones doesn’t really have much time for fantasy or illusion. Like Cersei, Sansa’s arsenal is limited to just two items: her body and her mind. 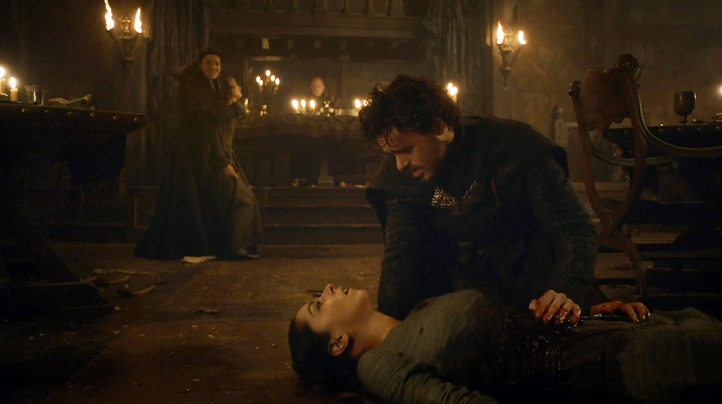 Game of Thrones has taught us that it’s always better to sacrifice the former if it means protecting the latter.7 So when Baelish assures Roose Bolton that Sansa’s “virtue” is intact, it’s worth remembering that every character worth cheering for on Thrones has been physically hurt in a significant way: Jon Snow was shot with Ygritte’s arrows (and Cupid’s, too, when you think about it), Jaime lost a hand, Bran his ability to walk, and Tyrion nearly lost his nose. Daenerys may be, as yet, unburnt, but she still walked out of a raging funeral pyre. I want to scoff at Littlefinger, but he’s got a point. If Sansa wants to be happy, she’s living in the wrong universe. If she wants revenge, she’s aligned with the wrong team. But if she wants access to the levers of power, she’s going to have to become that lever herself. Brienne, who suffers innumerable slings and arrows despite wielding one of the world’s most formidable swords, is a constant reminder of this imbalance. Being a tough and capable fighting woman in Westeros is unusual enough. The fact that she is 10 times as chivalrous and loyal as any member of the vaunted Kingsguard means she may as well hail from the moon. Yet she doesn’t stand apart from the world, clucking at its faults like the High Sparrow or tumbling from one gilded cage to another like Tyrion. She attacks it head-on, using her sword and her strength to chip away at whatever stands in her way. She is capable. She is active. And she never, not for a moment, despairs. That her reasons for being this way were revealed now, some years after the character’s debut, was surprising but also devastatingly effective. (It should also be noted that Gwendoline Christie, always good, was truly great in the scene, brandishing a winding and tricky speech like Valyrian steel.) On a structural level, it was proof that Benioff and Weiss are capable of playing the long game as well as Littlefinger does. By dropping Brienne’s backstory into this episode, they were able to connect her evolution with those being attempted by all of the prominent female characters in the frame. 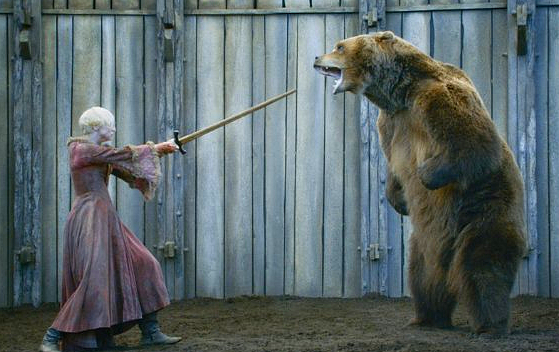 Brienne was transformed, we learn, not just by cruelty but also by kindness. Renly — always the fun Baratheon, by the way — helped turn the “lumbering beast” of Tarth from a punch line into someone more than capable of throwing a punch. In other words, it wasn’t enough to give up something external — vanity, pride — she also had to embrace something essential at her core. It didn’t matter what other people saw when they looked at her. What mattered was when someone else took the time to see the truth. This is why Arya Stark remains the most promising player in the entire Game of Thrones universe. As she demonstrated at the harbor, she is more than willing to give up everything that once defined her: her clothes, her money, her name. It’s a sacrifice that demands the question: Is it better to be a woman in Westeros or “no one” in Essos? I think I know the answer. As Podrick points out, a “shadow” is awfully tough to kill. But a moment later, on the beach, Arya proved her wisdom by burying her beloved sword beneath some rocks. Jaqen, though not nearly as merry, looks at Arya much like Renly once saw Brienne. But his interest is limited to changing “a girl,” not the entire world. And besides, abandoning every aspect of your life isn’t the same thing as dying. Living in Game of Thrones isn’t a right, it’s a battle. In our world, we tend to praise those who don’t go down without a fight. Arya is smart to realize that in the Seven Kingdoms, you can’t go up without one, either. Or maybe I should say Arya and the Mountain? The way the presumed-dead, elder Clegane was Frankensteining away underneath Qyburn’s sheet suggests an imminent comeback. This is an admittedly ridiculous image. Like Westeros has playgrounds! This makes sense since no other show can afford to. Seriously: Grumpy, graying Stannis is having a Duncan-like fourth quarter. I was delighted to see Jonathan Pryce, his eyes dancing, in the role. 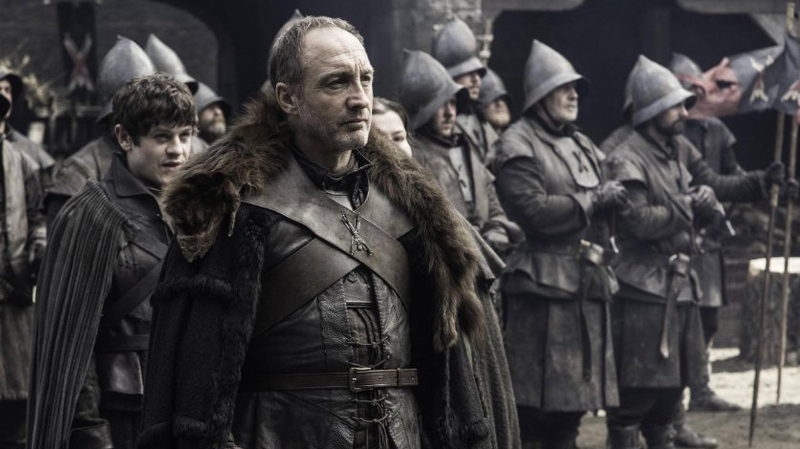 Not only is he dependably excellent, I believe that, legally speaking, he’s the last British actor to be cast in a supporting role on Thrones. Which raises the question: Is the Artist Formerly Known As Theon slowly regaining some autonomy? Sure, he was still digging ditches and hand-carving meat for his castrator. But his long looks in Sansa’s direction certainly foretold something.